This post was first published on the Idealware Blog in February of 2010. Long time readers of my ramblings here are aware that I drink the Google kool-aid. And they also know that I’ve been caught tweeting, on occasion. And, despite my disappointment in Google’s last big thing (Wave), I am so appreciative of other work of theirs — GMail, Android, Picasa — that I couldn’t pass up a go with their answer to Facebook and Twitter, Buzz. Google, perhaps because their revenue model is based on giving people ad-displaying products, as opposed to selling applications, takes more design risks than their software-developing competitors. Freed of legacy design concepts like “the computer is a file cabinet” or “A phone needs a “start” menu“, they often come up with superior information management and communication tools. Buzz, like Twitter and Facebook, and very much like the lesser used Friendfeed, lets you tell people what you’re up to; share links, photos and other content; and respond to other people’s posts and comments. Like Facebook, Friendfeed and Twitter (if you use a third party service like Twitterfeed), you can import streams from other services, like Google Reader, Flicker, and Twitter itself, into your Buzz timeline. Unlike Twitter, there is no character limit on your posts. And the comment threading works more like Facebook, so it’s easy to keep track of conversations. The big distinguishing factor is that Buzz is not an independent service, but an adjunct of GMail. You don’t need a GMail account to use it, but, if you have one, Buzz shows up right below your inbox in the folder list, and, when a comment is posted on a Buzz that you either started or contributed to, the entire Buzz shows up in your inbox with the reply text box included, so that continuing the conversation is almost exactly like replying to an email. The Gmail integration also feeds into your network on Buzz. Instead of actively seeking out people to follow, Buzz loads you up from day one with people who you communicate regularly with via GMail. Buzz’s release on Tuesday spawned a Facebook-like privacy invasion meme the day that it was released — valid concerns were raised about the list of these contacts showing up on Buzz-enabled Google Profile pages. A good “get rid of Buzz” tutorial is linked here. To Google’s credit, they responded quickly, with security updates being rolled out two days later. I’m giving Google more of a pass on this than some of my associates, because, while it was a little sloppy, I don’t think it compares to the Facebook “Beacon” scandal. Google didn’t think through the consequences, or the likely reaction to what looked like a worse privacy violation than it actually was (contact lists were only public on your profiles if you had marked your profile “public”, and there was a link to turn the lists off, it just wasn’t prominently placed or obvious that it was necessary). Beacon, in comparison, started telling the world about every purchase you made (whether it was a surprise gift for your significant other or a naughty magazine) and there was no option for the user to turn it off. And it took Facebook two years to start saying “mea culpa”, not two days. Twitter’s “gimmick” — the 140 character limit — defines its personality, and those of us who enjoy Twitter also enjoy the challenge of making that meaningful comment, with links, hashtags, and @ replies, in small, 140 character bursts. It’s understood now that continuing a tweet is cheating. Facebook doesn’t have such stringent limits, but you wouldn’t necessarily know that to glance at it. It hasn’t shaken it’s dorm room roots; it’s still burdened by all of the childish quizzes and applications; and, maybe more to the point, cursed by a superficiality imposed by everyone having an audience composed of high school buds that they haven’t seen for a decade or two, and who might now be on the other side of the political fence. But Buzz can sustain a real conversation — I’ve seen this in my day and a half of use. Partially because it doesn’t have Twitters self-imposed limit or Facebooks playful distractions; and largely because you reply in your email, a milieu where actual conversation is the norm. This is significant for NPOs that want to know what’s being said about them in public on the web. I noted from a Twitter post this week that the Tactical Philosophy blog had a few entries discussing the pros and cons of Idealists‘ handling of a funding crisis. But Twitter wasn’t a good vehicle for a nuanced conversation on that, and I can’t see that type of dialogue setting in on Facebook. Buzz would be ideal for it. This week, Google rolled out Buzz to GMail. Down the road, they’ll add it to Google Apps for Domains. The day that happens, we’ll see something even more powerful. Enterprise microblogging isn’t a new idea — apps like Yammer and Socialcast have had a lot of success with it. I’m actually a big fan of Socialcast, which has a lot in common with Buzz, but I was stumped as to how I could introduce a new application at my workplace that I believe would be insanely useful, but most of the staff can’t envision a need for at all. What would have sold it, I have no doubt, is the level of email integration that Buzz sports. By making social conversations so seamlessly entwined with the direct communication, Google sells the concept. How many of you are trying hard to explain to your co-workers that Twitter isn’t a meaningless fad, and that there’s business value in casual communication? Buzz will put it in their faces, and, daunting as it might be at first, I think it will win them over. This entry was posted in Social Media and tagged communication, email, Facebook, gmail, google, google buzz, Idealware Blog, privacy on April 22, 2010 by Peter Campbell. Now, you might think that’s a crazy idea, but I think Buzz is about 80% of the way there. Last week, in my Google’s Creepy Profiles post, I made a suggestion (that someone at Google has hopefully already thought of) that it wouldn’t take much to turn a Profile into a full-fledged biography/lifestreaming site. Just add some user-configurable tabs, that can contain HTML or RSS-fed content, and add some capability to customize the style of the profile. Since I wrote that, I’ve been using Buzz quite a bit and I’ve really been appreciating the potential it has to deepen conversations around web-published materials.I think some of my appreciation for Buzz comes from frustration with Google’s previous, half-hearted attempts to make Google Reader more social. If you use Reader heavily, then you know that you can share items via a custom, personal page and the “People You Follow” tab in Reader. You also know that you can comment on items and read others comments in the “Comments View”. But it’s far from convenient to work with either of these sharing methods. But, once you link your reader shared items to Buzz, then you aren’t using Reader’s awkward interface to communicate; you’re using Buzzes. And Buzz, for all of Google’s launch-time snafus, is an easy to use and powerful communications tool, merging some of the best things about Twitter and Facebook. So, how is Buzz suitable for a blog? It’s a rich editing environment with simple textile formatting and media embedding, just like a blog. RSS-capable – you can subscribe to anyone’s Buzz feed. Your Google Profile makes for a decent public Blog homepage, with an “About the Author”, links and contact pages. As mentioned, more customization and site-building tools for the Google Homepage. Because your blog posts are directly inserted into a social networking platform. No need to post a link to it, hope people will follow, and then deal with whatever commenting system your blog has to respond. Your blog’s community grows easily, again fueled by the integrated social network. Managing comments – no longer a chore! This is the inverse of adding Google or Facebook’s Friend Connect features to your blog. it’s adding your blog to a social network, with far deeper integration that Twitter and Facebook currently provide. Once Google releases the promised API, much of what’s missing will start to become available. At that point, I’ll have to think about whether I want to move this island of a blog to the mainland, where it will get a lot more traffic. I’ll definitely be evaluating that possibility. This entry was posted in Blogging, Social Media, Web and tagged communication, google, google buzz, identity management, rss, seo, webdev on February 21, 2010 by Peter Campbell. Google unveiled a bold new product last week; one of critical and compelling import to anyone who believes that their online reputation is important. I’m not talking about Google Buzz. I’m talking about Google Profiles. This isn’t a new service — Google introduced the profile pages a few years ago. But the release of Google Buzz has illuminated how important they are in Google’s plans, and how important they can be for us. And if this profile is now a major component in my personal branding strategy, I demand better tools to manage it than Google has provided. About a year ago, Google pointed out that, if you have a populated Google Profile, they will include it below the search results when people google your name. So, for someone like me — who does want to be easily located on the web, but has a reasonably common name, this seemed like a good deal, and I filled out my profile. As a result, I’m prominently placed in the profile links when you search for my name, even though I’m about the fifth best known “Peter Campbell” on the web. Links to your important web sites. The bio and links are much like other online profiles, such as Yahoo! and Facebook. The contact info option is interesting, as you can share it with groups defined in your Google Contacts. I can’t see a good reason to do this, as any group I’d be willing to share with (such as “family”) already knows how to find me and, if they don’t, they aren’t going to think to look at my Google Profile(!). So I’ve left this blank, as it seems like better security to not publish my address and phone number online if I don’t have a good reason to. The Buzz integration is particularly worrisome. First, by default, Buzz publishes your connections to your profile. It’s easy to turn off, and recommended if you have any concern about anyone in the world knowing who your online friends are. I turned this right off. The furor over Buzz’s privacy violations at rollout were really much more about the profiles — many new Buzz users didn’t even know they had a Google Profile prior. Less structured content. The “what can’t you find on Google” question is cute, but it’s not a key component of my personal branding. Get rid of the cute stuff, and give me more options to share the info that I want to share, not that you necessarily want to hear. A logo, stylesheet, and other basic web design tools. I’d like this to look more like this blog, with the black background and the Techcafeteria logo. My own tabs, and the ability to remove the extra tabs that you think I should have. Mostly, the decision to publish my Buzz feed to my profile should be mine, not yours. Make that optional, but add the ability to add new tabs and link them to other websites or RSS sources. For an example, look at my home site at http://techcafeteria.com. That is a profile, with info about me; lifestreaming; shared resources via RSS; and a contact form. If Google Profiles could do what I ask, I’d scrap the current Techcafeteria site and link this blog, along with my other feeds, directly to my Google Profile, and redirect both techcafeteria.com and peterscampbell.com to it. Until then, that’s not my profile. That’s Google’s profile of me, and it’s a bit creepy. 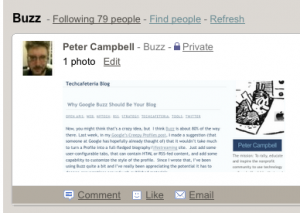 This entry was posted in Blogging, Social Media and tagged google, google buzz, identity management, privacy, security on February 15, 2010 by Peter Campbell.